Dominique is a sound editor and artist from Montreal, Canada. After completing university degrees in film and photography, she pursued a love for all things audio by working and volunteering in community radio. 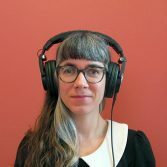 She has taught workshops to young and old in sound art, audio editing, photography and other creative pursuits. When she's not working, she loves to hike, forage for wild edible plants, knit, and take photos with old cameras.